The purpose of Call Center Best Practices is for managers to be able to improve the call center productivity, efficiencies and be aware of overall status. Productivity and efficiency improvements begin with the agents. By following best practices for each application the call center improvements will happen. The best practices will help you run an effective inbound, outbound or blended call center. This is an enewsletter copy of the Best Practices for Manager Dashboard. Visit the Spectrum website or SlideShare for the full version. There are many challenges for the supervisors and manager of the contact center: performance levels for the groups and agents, status of the agents and of the calls, emails, chats, call backs, tickets, call volume, abandon rates, wait times and all of this both real time and historical. 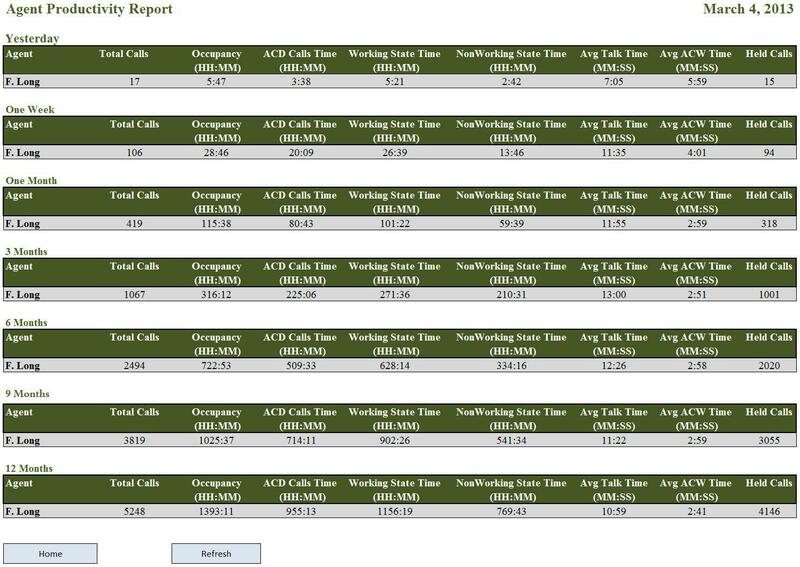 As a supervisor or manager access to this high level of data with drill down availability is a vital requirement to maintain call center success. If your contact center communicates with customers by voice, email, chat, ticketing systems and/or social media your dashboard needs to combine this data. Each of these applications has reporting but you need to combine this data together and see the performance and status of the group across all platforms. By combining the data together you get the complete view of the group and agent performance levels. 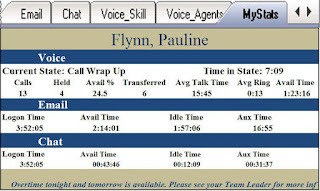 The example above has combined voice, email and chat into a single page report so the manager can see the current summary status for each group. The combined report should have multiple pages (tabs) of data. 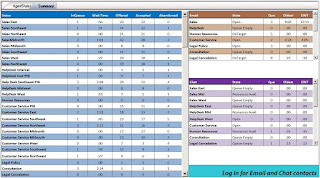 Each tab should be a breakdown of the groups, agents, departments and national or global locations. The objective is to actively be able to see the current status or performance for each group, department, etc. The combined report saves you, the manager, valuable time. Instead of opening multiple separate reports to see the current status open just one report that has all of this data combined. This dashboard is running ten reports. The first report is a summary of all groups combining voice, email, chat and trouble ticketing together. The remaining nine reports are details about each group. The manager is quickly able to see the performance for all of the groups and then drill down to see details about a specific group to determine what is happening with that group. In the past this manager had to go to each of these separate software applications to see this same data. What used to take over an hour and sometimes never done now takes seconds. There are many ways to view combined data. There is only one best practice for the view and that is to be sure you combine the data together so you are able to see the overall status of all communications with the customer. How the data is laid out, what data you see, when you look at the data and how much data you report on is all up to you and the business you are in. Combining some confidential data such as revenue or sales into the report can be vital to some businesses, groups or call centers. If certain data is relevant and can show the effects of positive or negative performance than combining that data into the dashboard is a smart choice. When data from multiple channels is combined together the result will be a lot of data or the current buzz word is: Big Data. Your reporting software is collecting a lot of data from different channels and will display all of that data into a report. Your choices might include the ability to add graphs and charts to the report. Best practices state that you should not use graphs and charts as they will take your attention away from all of the other data. Critical KPI’s can and should be in their own tab or report. Metrics and KPI’s that are critical should be in their own report or tab and can be text, chart or graph to gain your attention. Combining the data should not stop when looking at the critical metrics. 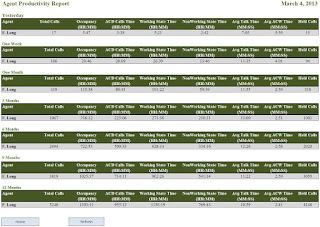 Calls, emails, chats, tickets waiting to be answered will still be displayed in a combined report. It is your decision as to which critical KPI’s you should display on this tab or page of the report. Spectrum survey of customer’s shows the following to be the top critical KPI’s. These statistics are not by industry. 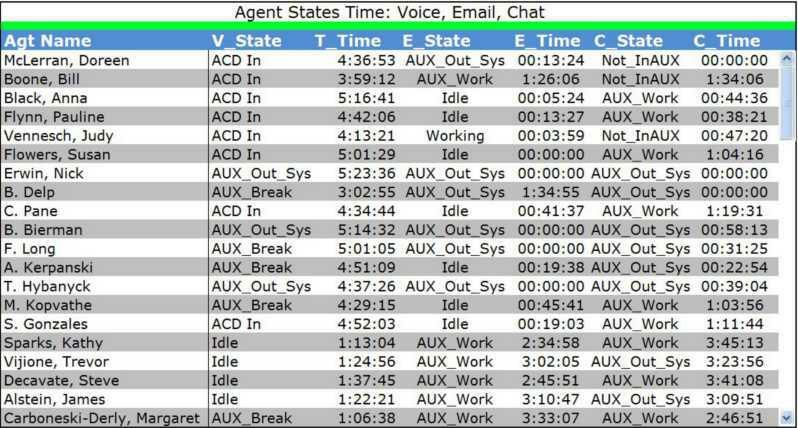 If you select these KPI’s along with the groups in the call center you can display this content with threshold alerts and get your attention. By keeping critical KPIs and metrics in their own report you are able to immediately see areas that need your attention and can make adjustments within the contact center. Threshold alerts and notifications on critical KPI’s are not hidden as they would be if they were mixed in to a complete all data report. From the critical KPI tab you are also able to send out messages to the proper agents and get them to reply to the critical KPI’s that have exceeded a threshold. If you were reviewing a tab with all data you could easily miss critical KPI’s because your focus is typically on the greater picture of overall status and performance for the contact center. Again best practices implies that critical KPI’s for the agents should be in a report separate from the summary KPI’s and metrics report. Data for each group should be summarized for the key metrics but leaving out the critical KPI’s for a separate report tab. The summarized data will combine the key metrics that provide you with the overall performance for the groups. Too often we think of the states of the agents as the only data we should be reviewing when we should also be reviewing the performance of the group. 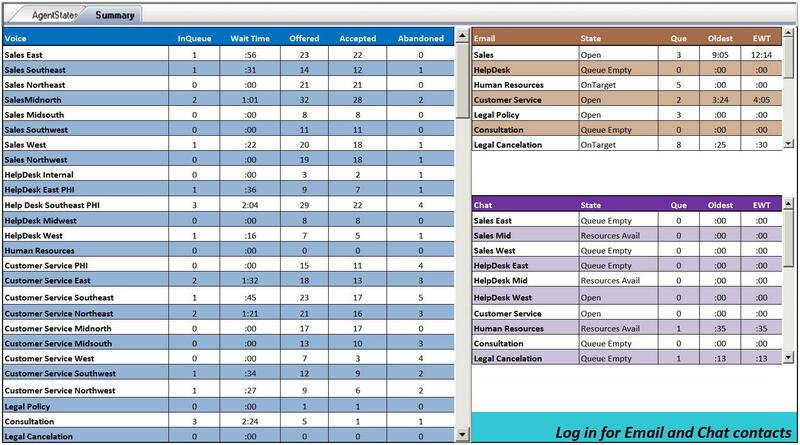 There are other metrics that could be displayed on your dashboard that will reference your contact center performance. Best Practices focus on the one listed above however your business might require more data. For example if revenue is critical to your call center including total sales volume per channel would be important to understanding your call center performance. Summarized states for the group and agent level is vital for knowing the states and status of agents throughout the day. The occasional view of this data at key times during the day / week / month will help you learn agent status and their individual performance. This information is very helpful for annual reviews with the agents. The states that should be monitored are Voice, Email, Chat and Tickets. What state are they in and how long have they been in that state. This report can be taken a step further and make this historical for the week, month or year. That type of dashboard will be of value to you if you compare the agent’s status against the goals or trends for that agent’s position. Best practices for agent status and performance state that the data should combine all data and focus the data on a specific category. Categories include states, volumes or handled. Do not try to put too much on a single screen as the data becomes overwhelming to review in a short period of time. Another option is to combine the Aux states that are non-productive states. Having a historical view of the total time an agent has been logged into a non-productive state can be helpful in understanding why other KPI goals are not being met. In the call center you have multiple groups and each group will probably have its own set of goals. Goals such as abandonment rates, calls/emails/chats taken, ticket conversion rates and many more are the standard for the call center. The dashboard should compare the goals to the actual performance. This report is a trend report and in text or a graph shows the comparison of actual versus the goals. What are the goals for the agent or group and how are they doing compared with what your goal is for the agent or group. Too often the agent has a separate set of goals compared to what the manager has for the goals for the agent or group. From the agent point of view the goal that will compensate them the most is the one they will focus on. Or which goal will create the most problems for the agent. These comparisons can be done with real time data such as call volume and / or it can be done historically such as by interval, for the day, week, month or year. These comparisons over time, trends, are valued because they display historical performance. You now see the performance over time instead of just one interval or day. These trend comparisons will show you performance at key times during the week / month / year. From a best practice point of view your business and industry would determine the proper historical trend you should be reviewing. If your business is cyclical seeing the trend over the year will give you a good comparison quarter by quarter for the year. This valuable review helps you see the outcome of adherence levels, product or support issues and agent or group performance. If your goals change throughout the week, month, quarter or year it is important to realize that up front and have your dashboard conform to these changes. If you are displaying a quarterly time frame dashboard and your goals change monthly you will need to be sure you have the correct data in your database so the trends comparison is accurate. Goals and trends that should be reviewed in your dashboard are determined by your business, the group or the agent. Do not look to benchmark numbers, industry reviews or editorial comments as your guideline to the goals and trends reporting that you have on your dashboard. Having a historical review of the agent performance is a fantastic report to share with the agent during the review period. Regardless of how the agent is performing having their performance both in real time and historical helps the manager show the agent key areas they can improve or where they are doing very well. Seeing overall agent performance gives the manager or supervisor key points to focus on. Is there something that is causing the poor performance, is there something that is causing the volumes to increase, are the agents lacking communications amongst each other? There are many questions that will come up because of the real time and historical performance information. Do not view these reports as bad news use these reports to find out what is causing the good as well as the bad operational performance by the agents. The report needs to include combined data across channels as well as agent states. In the web report above there are three key performance indicators: Occupancy, Working State and Non-working state time. Each of these KPI’s is a combination of data from multiple sources. The idea is to know how the agent is truly performing across multiple channels and in multiple job functions. As the agent logs into another state they are tracked so we know what they are doing throughout the year. Best practices for a real time performance report states that it should include data from across the channels and not leave anything out. Managers or supervisors need this data to know at any time how the agents are performing. There are changes to the call center that can affect the agent performance. If we wait until the year-end review we may forget about things that were causing bad performance. A new product release can immediately affect the agent performance, managers need to know how product changes affect the call center performance. Anything that adversely affects agent performance needs to be documented. Being aware of the performance challenges is the first step. 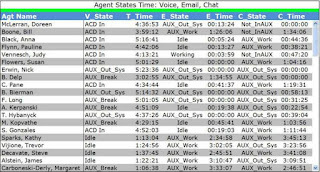 A combined interval summary report for agent status. Depending on your call center the supervisor may also be an agent at times. Large contact centers have multiple groups and each group needs a supervisor to aid and assist the agents. However when contact volume is up the supervisors also need to be working with the customers. Reporting on the dashboard for these supervisors allow them to see how their group is performing while they are busy. The small dashboard below shows their own stats but also gives them the opportunity to see how the group is performing across the other channels. In this example the supervisor can see her stats but can also click on the group level status across the other channels. While this is somewhat outside of the manager dashboard best practices for a supervisor states performance and status information for the group is vital. The best practice for dashboard messaging is to have a multiple level threshold message sent to the manager dashboard. An example could be there are trouble tickets from platinum level customers, emails from platinum level customer, customer service reps available, and none of the tickets or emails has been opened yet. A message is now sent to the manager alerting them to this current status. Best practices for the managers dashboard clearly states that the data from multiple channels should be combined and displayed together. There can be multiple tabs of content breaking down the data from overall summary to individual groups and agents for a group. Do not try to combine attractive graphs and chart to your text filled report because you will not be able to focus on group and agent level statistics as you respond to critical KPI’s and Metrics. Keep the critical separated from the summary reports. If your contact center does not have multiple channels of customer contact best practices for dashboards says to focus on the KPI’s are that most affected by performance and agent status throughout the day. 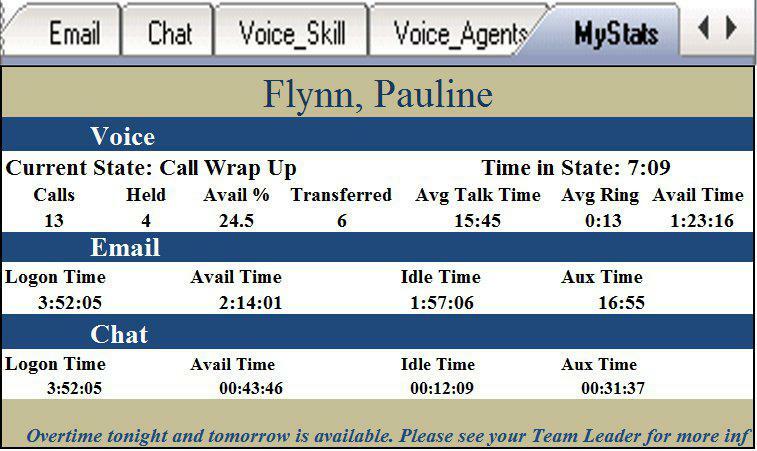 Being alert to the agent performance and status throughout the day can help reduce poor overall performance. Goals and trends within the call center is a report that will inform the manager of the overall performance compared to the targets set for the call center. This comparison report is not a critical report however it does show how the business and / or contact center is functioning. Is contact volume lower than it should be and is that a good or bad thing?